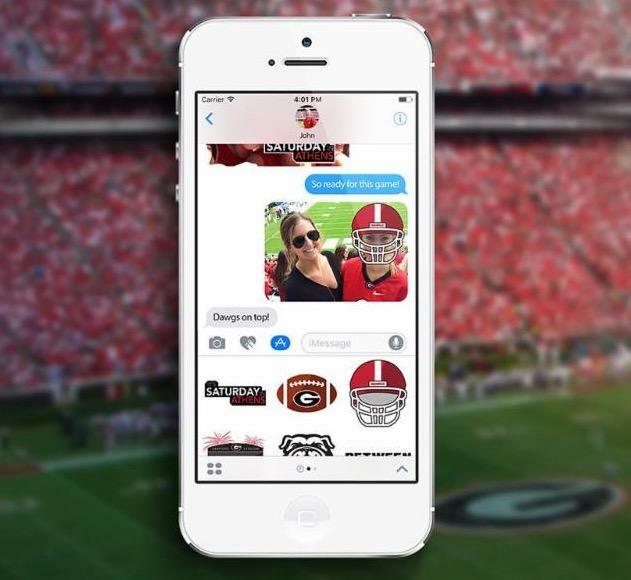 You may remember that this time last year, the NMI and UGA Athletics teamed up to release the NMI’s first native iOS app and UGA’s first iMessage sticker pack. UGA Stickers takes advantage of the new features added to iMessages in iOS10. The app allows users to “peel” stickers of their favorite Georgia sayings, logos, and images and stick them on text and photo messages. Since launch, the app created by Emily Greenwood, Reilly Megee, Sam Moran and Ian Webb has been downloaded thousands of times. Now, the team is excited to launch a new update introducing brand-new stickers for the 2017 football season! In just a few short weeks since the new version was released, the app already boasts over 6500 updates and more than 500 new installs. From “Beat App State” to “Wreck Tech,” UGA Stickers remains the perfect way to show your love for the Dawgs. For more information about the project, check out UGAStickers.com. And be sure to visit the App Store today to download or update your UGA Stickers app, so you can be ready to help UGA take on Mississippi State this weekend!